If you're one of those people who like to shop in the name-brand stores you know and love, you're in luck. If you're one of those people who revel in visiting one-of-a-kind boutiques and come-take-a-peek shops, you're in luck, too. If you just LOVE to shop, you are really in luck. Because Greenville has shopping and more shopping, from specialty shops to malls. Greenville is a great place to find exactly what you're looking for and the thrill of the hunt! 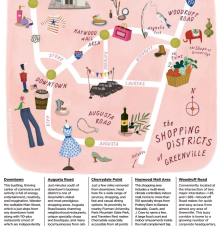 Grab Our Printable Shopping Districts!